It looks like 1.3000 was unable to hold the Euro bulls down as the pair broke past and hit my stop loss level. So, I took a small hit this time and the question now is, “are we now witnessing a change in sentiment?” Ridiculous amounts of money have been thrown at the credit crisis, interest rates are dropping across the globe, and the majority of de-leveraging may have run its course – is it time for risk taking behavior to come back? I don’t know, but if it is, we probably won’t see the same type of volatility we’ve seen over the past few years as we are now in an environment where institutions can’t get access to cheap and easy money, and don’t trade on such high leverage. We are in a new age and it’s time to make some adjustments. 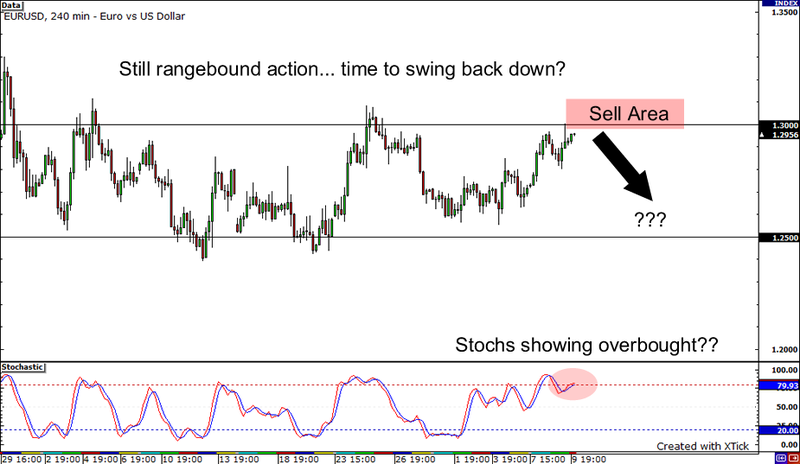 As for the EUR/USD, this may be a breakout of the range and a new trend higher forming. I will continue to watch and plan for the possible move higher. Stay tuned! What’s up! It looks like markets are calming down for the holidays and traders are staying away from taking bets as we approach the end of the year. EUR/USD has been rangebound for the past month or so, and that’s how I will play it out as the pair approaches the top of the range. I have the 4 hour chart up and we can see the pair recently found resistance at 1.30. With stochastics in overbought territory, 1.3000 may continued to be watched and played as a resistance level by those still left in the market.